CFast 2H-M is the latest enhancement of conventional Cfast form factor that delivers various technological advantages. This new flash memory card comes with SATA 6.0 Gbps interface for higher performance and is compliant with standard Cfast specifications. Cfast 2H-M consists of SATA-based 7-pin signal segment and 17-pin for power and control purposes. It can offer moderate capacity and decent data transfer performance. For power efficiency, this new flash memory card leverages the technological benefits of SATA Revision 3.0 specifications. For data integrity, the Cfast card is built with ECC engine correcting up to 72-bit. 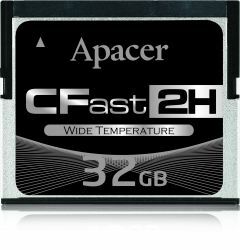 Together with its small form factor nature, Apacer Cfast 2H-M is definitely the ideal solution for applications in industrial computing systems, mobile computers and video processing instruments.